In 1988, scientist and veterinarian Kristina Narfström met with a breeder of Briard sheepdogs. One of the puppies in the breeder’s litter was behaving oddly – bumping into objects its siblings walked around. When Narfström tested the puppies, she discovered that 6 out of the 9 had poor vision… vision that worsened as they grew until the pups went blind. Research revealed that the Briards had a mutation in a gene called RPE65. In humans, RPE65 mutations cause a form of blindness called Leber’s Congenital Amaurosis Type 2. It’s degenerative, and until recently, there was no treatment, no cure. But that’s about to change. In 2016, a biotech firm called Spark Technologies will apply to the FDA, asking for approval for a gene therapy to treat LCA2. If successful, it will be the first gene therapy approved in the USA. It’s been a long time coming. The first animal tests for the treatment – done on Briards who became ambassadors for the research – happened in 2000. The first human trials didn’t start until 2007, long enough to be sure that the dogs stayed cured and suffered no dangerous side effects. In 2008, a young boy named Corey Haas received the treatment – an injection of 48 million copies of a healthy RPE65 gene under the retina of his left eye, where scientists hoped they’d replace the faulty genes Corey was born with. Four days later, a boy who used to stare at lightbulbs recoiled from the brightness of the sun – the gene therapy worked. Gene therapy for LCA2 offers the chance of a cure to thousands of patients who would otherwise go blind. And scientists are working on therapies for other rare diseases, too. The research is difficult, expensive, and sometimes has unpredictable and tragic side effects. But for many kids diagnosed with genetic diseases, it’s the only hope. It’s winter solstice tomorrow, the night that everyone – at least everyone living in Canada! – celebrates as a sign that the sun is about to return. As we rejoice in the coming of the light, let’s take a moment to think of all the patients with LCA2 who might, someday soon, be able to see it with us. 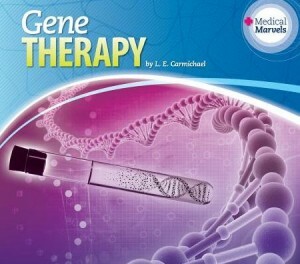 For more on Corey’s story, and other milestones in gene therapy research, check out my book Gene Therapy. Next Post: Until 2016, My Friends!